本文描述了利用锋利的金属或玻璃针和/或之后的成型工艺加工和制作固体溶液穿孔器(SSP)的方法及其使用。 This article describes the use of sharp metal needle or a glass molding process and / or after the method of making a solid solution and a perforator (SSP) and their use. 所述的方法需要通过各种精密加工技术和微型模具结构利用固化材料制成微型针。 The method requires the use of microneedles made of the cured material by a variety of micro-precision machining and mold construction. 本文描述了各种贴剂、盒和敷抹器的设计，也描述了利用配方和/或后干燥过程调节微型针的机械强度的方法。 This paper describes various patch, cartridge and applicator design, also describes a process using the formulation and process control microneedle drying and / or after mechanical strength. 本申请根据35U.SC§ 119(e) (I)要求2008年5月21日提交的美国临时申请N0.61/128,405的权益，其全部内容在此引入作为参考。  This application claims 35U.SC§ 119 (e) (I) asked the US May 21, 2008 filed provisional application N0.61 / 128,405, the entire contents of which are incorporated herein by reference. 本发明一般地涉及制造和生产固体溶液穿孔器(SSP)的方法，诸如用锋利的金属、或玻璃针、或精密加工和/或随后的成型制作可溶性微型针。  The present invention relates to a method for producing a solid solution and production perforator (SSP) in general, such as the production of soluble microneedles with a sharp metal needle or a glass, or precision machining and / or subsequent shaping. 本发明尤其涉及一种从细针阵列排列(fine needle array alinment)产生由固化材料制成的微型模具结构的制作方法及其使用。 The present invention particularly relates to a needle arranged in an array from (fine needle array alinment) generating method of manufacturing a micro structure of a mold made of cured material and its use. 此外，本发明涉及通过设计柔性的微型针贴剂提高微型针机械强度的方法，和贴剂注入/插入的方法及其使用。 Further, the present invention relates to improving the mechanical strength of the microneedles through the design of a flexible microneedle patch method, and a patch injection / insertion method of use thereof. 经皮或皮内药物递送，包括蛋白质和疫苗的递送，是一种非常有效的获得全身或者局部药理作用的方法。  Percutaneous or transdermal delivery of the pharmaceutical, including the delivery of proteins and vaccines, is a very effective method of obtaining a local or systemic pharmacological effects. 但是，在经过皮肤提供足够的药物渗透时会有障碍。 However, there will be obstacles in providing adequate penetration of the drug through the skin. 皮肤由多层组成。 Skin consists of multiple layers. 角质层是最外层，接着是可见表皮层，最后是真皮组织层。 The stratum corneum is the outermost layer, followed by a visible epidermis, dermis layer finally. 10〜50μπι的角质层薄层代表通过皮肤递送药物的最主要的障碍。 10~50μπι thin stratum corneum represents the major obstacle to the delivery of drugs through the skin. 根据原料药的物理和化学性能，特别是亲油性和分子量，角质层占到50%〜90%的阻止经皮给药的皮肤阻隔性能。 The physical and chemical properties of the drug, in particular the molecular weight and lipophilicity, accounts for 50% ~ 90% of the stratum corneum of the skin barrier properties to prevent transdermal administration. 由于皮内给药或药物抽样可以通过减少上述障碍实现且无痛无血，在经皮递送和皮内递送中使用微型针是有利的。  Since the intradermal sampling or medicament may be reduced to achieve the above and painless blood disorders, percutaneous delivery and intradermal delivery are advantageously used by the microneedles. 本文中所使用的“微型针”一词指的是多个细长结构，其足够长以穿透角质皮肤层进入表皮层或真皮或皮下组织。 As used herein, the term "microneedles" refers to a plurality of elongated structure, which is long enough to penetrate the horny layer of the skin epidermis into the dermis or subcutaneous tissue. 尽管在一些情况下需要或希望穿透到真皮层，但是微型针一般不会这样长可以穿透到真皮层。 Although in some cases necessary or desirable to penetrate the dermis, but generally not for such a long microneedles can penetrate into the dermis. 作为使用皮下注射针注射给药的替代，美国专利N0.3964，482中公开了微型针的使用，在该专利中，用实心的或空心的微型针的阵列穿过角质层进入到表皮层。 As an alternative to the use of a hypodermic needle injection administration, are disclosed in U.S. Patent No. N0.3964,482 microneedles used in this patent, an array with a solid or hollow microneedles through the stratum corneum into the epidermis. 液体可通过以下方式配送:通过空心微型针或通过可透水的实心的突出部分，或绕着被透水材料或孔包围的不可透水的实心的突出部分。 Liquid distribution in the following manner: through the hollow microneedles or through permeable solid projection, or around the projecting portion of the non-permeable solid material surrounded by a permeable or holes. 用膜材料来控制药物释放的速率，药物运送的机理是吸收。 Film material to control the rate of drug release, drug delivery mechanism is absorption. 在 PCT 公开N0.W098/00193, W097/48440, W097/48441, W097/48442 和W096/37256中公开了其他类型的微型针和微型刃(miciOblade)结构。  In PCT Publication N0.W098 / 00193, W097 / 48440, W097 / 48441, in W097 / 48442 and W096 / 37256 disclose other types of microneedles and micro blades (miciOblade) structure. 微型针(直径小于Imm)已经被用于进行经皮给药，微型针也已经用于通过针中的腔递送药物，以沿着针状轴的外面递送药物，或者作为皮肤穿孔器用于之后的贴剂药物应用。 Microneedles (diameter less than Imm,) have been used for transdermal administration, the microneedles also been used to deliver drugs through the needle lumen to deliver the drug along the outside of the needle shafts, or as skin perforators for subsequent in patch pharmaceutical applications. 例如，已经利用微加工方法或微机电系统(MEMS)加工方法对硅制微型针进行了开发。 For example, (MEMS) processing methods of silicon microneedles have been developed using microfabrication or MEMS. 例子参见美国专利N0.6，334，856，6，256，533，6，312，612，和6，379，324。 See example U.S. Patent N0.6,334,856,6,256,533,6,312,612, and 6,379,324. 不幸的是，硅针不能在皮肤中溶解，在使用过程中会折断而留在皮肤组织中，从而产生相当大的刺激甚至感染。 Unfortunately, silicon needles can not dissolve in the skin, can break during use and stay in the skin tissue, resulting in considerable irritation and even infection. 非硅制微型针也已经被开发，例子参加美国专利N0.6，334，856和6，091，975。 Non-silicon microneedles have also been developed, and examples participate N0.6,334,856 U.S. Patent 6,091,975. 但是，用金属或塑料制成的微型针在皮肤中不能溶解或者溶解缓慢(即小于几个小时)，因此通常用于提供从药物容器中运送药物的微型管道，或用于产生微孔。 However, microneedles made of metal or plastic can not be dissolved or dissolved slowly in the skin (i.e., less than several hours), it is often used to provide micro-conduit conveying the drug from the drug container, or for creating micropores. 典型地，微型针用MEMS加工方法制造。  Typically, the microneedles manufacturing MEMS processing methods. 在美国专利N0.6，663，820和N0.6，334，856中公开了用于浇注聚合物的微型针的聚二甲基硅氧烷(PDMS)模具的使用，其中微型针的正性材料(positive matter)是用MEMS工艺制造的。 Discloses a polymer microneedles for casting and in U.S. Patent N0.6,663,820 N0.6,334,856 of polydimethylsiloxane (PDMS) mold is used in which a positive microneedle material (positive matter) is fabricated using MEMS technology. 但是，用MEMS制造母版(master)微型针阵列会很贵而且复杂，而且，聚合物微型针可能需要药物装载(loading)或药物涂布(coating),使烧注方法不适用于大规模生产。 However, a MEMS fabrication master (master) microneedle array can be expensive and complex, and polymeric microneedles may require drug loading (loading) or drug-coated (coating,), note that the method does not burn for large scale production . 本发明克服了这些问题并提供了用于生产包括可溶解微型针的SSP药物递送系统的不贵和不复杂的方法。  The present invention overcomes these problems and provides for inexpensive production of dissolvable microneedles SSP comprising drug delivery systems and uncomplicated way. 特别是，本发明公开了一种由不同类型的细针阵列制成的正微型针母版模具的制造方法。 In particular, the present invention discloses a method for producing the positive master microneedle mold is made of a different type of needle array. 本发明所用的微型针是通过由金属、聚合物，或玻璃(或其它可延长的)材料丝制成的模具来制得。  microneedles used in the present invention is achieved by a mold made of a metal, polymer, or glass (or other extended) materials made of silk be prepared. 为了由对齐的针制作正母版模具，用于正母版的单个的针是通过如打磨丝的端部或拉丝然后锐化的方法制成的。 In order to produce a positive master mold needles aligned, the needle for a single positive master is then formed such as by grinding an end portion of the wire drawing method or sharpening. 其它适合制造锋利的针的方法是公知的，并且将在本文中使用。 Other suitable methods for producing sharp needles are well known and will be used herein. 所述针可以有不同的形状，如截面为圆形或截面为正方形。 The needle may have different shapes, such as circular cross-section or a square cross section. 由丝制成的单个针集成或布置到母版结构中，比制造用于浇注最终可溶性的微型针的负模具相对较快而且成本低。 A wire made of a single needle arrangement or integrated to the master structure, the ratio of the final casting for manufacturing microneedle soluble negative mold for a relatively fast and low cost. 下面是在具有孔阵列的基底上布置微型针的过程示例。  The following procedure is exemplary microneedles arranged on the substrate having an array of apertures. 将针集成到孔板中的过程包括:(1)使具有孔阵列的第一和第二平板平行对齐，和(2)使针通过第一和第二平板的孔至第二平板之上的要求的预选的突出长度。 The needle plate is integrated into the process comprising: (1) the first and second plate having an array of holes aligned in parallel, and (2) to a needle plate on the second plate through the holes of the first and second preselected protruding length requirements. 针尖的位置可以通过下述方法来确定:(I)利用与第二平板相距要求距离处的停止壁，(2)利用第二平板中的圆锥孔，或(3)利用移动单个针的单独的可寻址致动器阵列。 Position of the needle tip can be determined by the following method: (I) using a second plate spaced a distance required to stop at a wall (2) in the conical hole of the second plate, or (3) the use of a single movement of a single needle addressable actuator array. 另外一个制造正母版模具的方法是通过精细加工，如计算机数字控制(CNC)的统削、打磨或钻孔。  Further a method for producing the positive master mold by the fine processing, such as Computer Numerical Control (CNC) system of cutting, grinding or drilling. 见例如《CNC加工手册》(CNC MachiningHandbook, James Madison,Industrial Press, Inc.，1991)，和讨论CNC方法的((CNC加工和编程导论》(AnIntroduction to CNC Machining and Programming, Gibbs and GrandelI, IndustrialPress, Inc.1996)。例如,从一块钢上，可以以预先确定的侧壁角(side-wall angle)在两个垂直方向上切割两个沟槽阵列，同时可以制作具有要求的侧角的棱锥形微型针。 See for example, "CNC Processing Handbook" (CNC MachiningHandbook, James Madison, Industrial Press, Inc., 1991), and discussed methods of CNC ((CNC machining and Introduction to Programming "(AnIntroduction to CNC Machining and Programming, Gibbs and GrandelI, IndustrialPress, Inc.1996). For example, from a steel, the side walls may be a predetermined angle (side-wall angle) cutting two grooves in two arrays in the vertical direction, while the pyramid can be made with the desired angle side microneedles. 另外一个制造正母版模具的方法是由负模具浇注微型针，该负模具用MEMS加工方法或者通过诸如钻孔或打磨的CNC精细加工方法制得。  Further a method for producing the positive master mold by casting a negative mold microneedles, the negative mold MEMS processing methods, or by CNC precision machining method such as drilling or grinding prepared. 本发明中称为“负模具”的模具，可以由母版微型针阵列结构制得，该模具可用于制作可溶性的SSP。 The present invention is referred to as "negative mold" mold may be made from the master manufactured microneedle array structure, the mold can be used to make soluble the SSP. 可溶性系统包括可溶性(包括可熔性)材料的固体基质，固体基质可选地保持(hold) —种或多种选定药物，且从负模具形成为一个或多个穿孔器。 Soluble Soluble system comprises (including meltable) material solid matrix, the solid matrix optionally held (hold) - one or more selected drugs and is formed from one or more negative mold punch. 所述的基质可以由快速溶解和/或膨胀材料组成。 The matrix may consist of fast-dissolving and / or swelling materials. 固体溶液可以是均匀溶液、非均匀溶液，具有不同载药量状态的悬液。 The solid solution may be a homogeneous solution, heterogeneous solutions, suspensions having different drug loading state. 为了制作可溶解的SSP，首先利用上面描述的方法制作正母版样板，然后由该正母版制作硅或固化材料的模具。 In order to make soluble the SSP, using the above-described first method for making a positive master model, then making a silicon mold or cured material from the positive master. 特别是，该辅助硅制负模具的制作可以进行符合成本效益的大规模生产，同时利用硅材料的固有性能，如表面张力、挠性、透气性等。 In particular, the production of secondary silicon negative mold may be cost-effective large-scale production, while silicon material inherent properties, such as surface tension, flexibility, air permeability and the like. 在另外一个实施例中，直到使用微型针阵列时，硅制负模具才会从微型针阵列脱离。 In a further embodiment, the microneedle array until use, before departing from the silicon mold from the negative microneedle array. 在该实施例中，由于硅材料价钱合理并且不贵，将硅制模具用作包装材料以保持微型针阵列完好。 In this embodiment, since the silicon material is not expensive and the price reasonable, the silicon mold is used as packaging material to maintain intact microneedle array. 在负模具的另外一个实施例中，在负模具中的微型针腔在腔的底部角落具有开口端，从而易于通过对该孔施加真空而给该腔填充凝胶，或甚至将凝胶压入该腔。  In a further embodiment the negative mold embodiment, the microneedle cavity in a negative mold having a bottom corner of the open end of the cavity, thereby easily applying a vacuum through the hole to the gel-filled chamber, or even to pour plastic pressed into the cavity. 通过在负硅制模具中浇注包含药物的水凝胶或类似的可塑性材料而制成包含药物的SSP微型针阵列。  SSP made microneedle array comprising a drug by the hydrogel or the like plastic material in the negative mold casting silicon containing the drug. 在制备固体溶液时，可以通过浇注和离心工艺使药物集中于微型针的尖端，诸如PCT公布N0.WO 07/030477中所描述的，其全部内容在此引入作为参考。 When preparing a solid solution, and centrifugation can be made by casting processes focused on drugs microneedle tip, such as PCT Publication described N0.WO 07/030477, the entire contents of which are incorporated herein by reference. “微型针尖端”表示微型针的圆锥端。 "Microneedle tip" microneedles denotes a conic end. 通常，药物会集中于微型针底部二分之一到三分之一处，优选地在微型针底部四分之一或更少的部分形成尖端。 Typically, the drug will be centered at one-half to one-third of the bottom of the micro-needle, the tip is preferably formed in the bottom of a quarter or less of the microneedle portion. 可以利用对药物凝胶和粘合剂层进行多次浇注/擦拭过程，在微型针之间浇注粘合剂层。 The drug may be utilized for the gel and the adhesive layer multiple casting / wiping process, casting an adhesive layer between the microneedles. 用粘合剂(特别是水基粘合剂)作为基底层，除了微型针部分，微型针阵列变粘，SSP贴剂在基底膜上不再需要另外的粘性的周边粘合剂。 With an adhesive (in particular, water-based adhesive) as the base layer, in addition to micro-needle portion, sticky microneedle array, the SSP patch is no longer needed additional peripheral adhesive tack on the base film. 挠性层可以层叠在粘合剂层上。 The flexible layer may be laminated on the adhesive layer. 最终的微型针将是具有挠性和自粘性的微型针阵列。 The final microneedle microneedle array will be flexible and self-adhesive. 在应用微型针贴剂中，载药贴剂安装在盒中。 Application microneedle patch, medicated patch is mounted in a cartridge. 盒连接到注射器上。 Connecting the box to the syringe. 当用注射器进行SSP贴剂给药时，微型针之间的粘合剂层可以使微型针贴剂固定在皮肤上。 When the SSP patch is administered with a syringe, the adhesive layer between the microneedles of the microneedle patch can be made on the skin is fixed. 盒可以在注射装置中使用，如在美国专利N0.6，945，952，N0.7，182，747和N0.7，211，062中所描述的，全部内容在此引入作为参考。  The cartridge may be used in the injection device, as described in U.S. Patent No. N0.6,945,952, N0.7,182,747 N0.7,211,062 and described, the entire contents of which are incorporated herein by reference . 所述的药物-微型针阵列贴剂贴在盒的中心，从而使微型针的尖端与注射目标皮肤接触。 The drug - microneedle array patch to the center of the cartridge, so that the micro injection needle tip into contact with the skin target. 诸如通过旋转锁定、推入配合、可拆卸胶水，通过磁性连接，或通过利用在注射器末端的所述盒的临时锁定装置，所述盒安装在注射器的末端。 Such as by rotating the locking, push-fit, glue detachably connected magnetically, or by using a cartridge in said temporary end of the syringe locking means, said cartridge is mounted at the end of the syringe. 敷药者可以通过击打所述盒中的微型针使得微型针的穿透深度保持一致。 Such that the penetration depth of the applicator may be consistent microneedle cartridge by striking the microneedles. 典型地，所述的盒是平的和薄的，优选地不厚于约10_。 Typically, the cartridge is flat and thin, preferably no thicker than about 10_. 所述盒的外面可以是任何不同的形状和尺寸。 Outside of the cartridge may be any of various shapes and sizes. 所述的盒可以由可塑塑料组成。 The cartridge may consist of a mouldable plastic. 所述的盒可以设计成一次性使用，用完就可扔掉。 The cartridge may be designed for a single use, can run away. 所述的盒可以与注射器的活塞相连，和活塞一起移动到皮肤。 The cartridge may be connected to the syringe piston, and the piston move together to the skin. 在一个实施方式中，将微型针阵列置于与目标皮肤靠近的位置而不是置于注射器的活塞上。 In one embodiment, the microneedle array was placed in a position close to the target skin rather than in the piston of the syringe. 这种设计易于使用且可以进行大规模生产而不损失效率。 This design is easy to use and can be mass-produced without loss of efficiency. 另外一种应用贴剂的方法是将用拇指或手指插贴剂，可以通过压力传感器薄膜或插入装置控制插入的力以及持续时间。 Further a method for applying a patch to a patch with a thumb or finger is inserted, the insertion force and duration of the film can be controlled by a pressure sensor or insertion device. 另外一个有效穿透进入皮肤的方法是通过微型针的配制和后干燥的过程来提高微型针的机械强度。  Another effective method is to penetrate into the skin by the microneedles to improve the formulation and drying procedure microneedles mechanical strength. 特别是，通过向基质聚合物(羧甲基纤维素)中添加单糖或二糖，微型针的机械强度可以得到提高。 In particular, by adding to the matrix polymer of monosaccharides (carboxymethylcellulose) or disaccharide, the mechanical strength of the microneedles can be improved. 此外，与模具分离后利用后干燥过程(或从微型针基质中去除额外的水成分)可以提高微型针的机械强度。 In addition, the use of a drying process after the mold separation (or additional water is removed from the microneedle matrix component) can improve the mechanical strength of the microneedles. 因此，在一个实施方式中，本发明提出一种制作微型针阵列的方法，包含:(a)通过将微型针放置在包含有上表面和下表面的限定平板(definingplate)中制作正母版模具，其中微型针以彼此相距预定距离进行放置，而且微型针的尖端从所述的限定平板的底部突出；(b)通过在正母版模具上浇注浇注料或将正母版模具浸入固化凝胶或热塑性材料中来制作负模具，从而制造具有和正母版模具相同的表面轮廓的负模具；(C)在负模具中添加可溶性聚合物从而形成微型针阵列；和(d)干燥微型针阵列。  Thus, in one embodiment, the present invention proposes a method of manufacturing a microneedle array comprising: (a) by the microneedles is placed with an upper surface and a lower surface defining plate (definingplate) produced positive master mold, wherein the micro needle is placed apart from one another a predetermined distance, and the tip of the needle protrudes from the bottom of the micro plate of said defined; (b) by casting cast on the positive master mold positive master mold or dipping the feed curable gel or thermoplastic material to make a negative mold, thereby producing a negative mold having the same positive master mold surface contour; (C) adding a soluble polymer in a mold to form a negative microneedle array; and (d) micro-dried needle array. 在特定的实施方式中，所有被放置在限定平板内的微型针从限定平板的底部突出的距离相同。  In a particular embodiment, all of the plates are placed in a defined microneedles projecting from the same defined distance from the bottom plate. 在其它实施方式中，被放置在限定平板中的微型针中的至少一个从限定平板的底部突出与其它微型针不同的距离。 In other embodiments, the plates are placed in the microneedles defining at least one microneedle projecting the other a different distance from the bottom of the defining plate. 在另外的实施方式中，使用一个致动器装置来调整在限定平板中的单个针的长度，该致动器在所述的限定平板中将单个针移至要求的距离。  In a further embodiment, the use of an actuator means for adjusting the distance defining a length of the individual plates in the needle, the actuator requires to move the needle will define a single plate. 在其它实施方式中，利用与所述限定平板相距要求距离处的停止壁来确定微型针顶端的位置。 In other embodiments, the determined position of the tip of the microneedle using the required distance apart defining a plate stop wall. 在另外的实施方式中，利用限定平板中的锥形孔来确定微型针顶端的位置。 In a further embodiment, the aperture defined by the tapered plates to determine the position of the tip of the microneedle. 在另外的实施方式中，所述方法进一步包含对负模具施加真空、离心或压缩力，以便利用可溶性聚合物和/或选定药物填充模具。  In a further embodiment, the method further comprises applying a vacuum, centrifuge or compressive force to the negative mold, so that the use of soluble polymer and / or a selected drug-filled mold. 在其它的实施方式中，所述方法进一步包含将干燥的微型针阵列与负模具分离。  In other embodiments, the method further comprising the dried microneedle array separated from the negative mold. (c)在负模具中添加可溶性聚合物从而形成微型针阵列；和(d)干燥微型针阵列。 (C) adding the soluble polymer to form a negative mold microneedle array; and (d) drying the microneedle array. 在特定的实施方式中，所述的钻孔、铣削或打磨是使用精密加工的方法完成的，如计算机数字控制(CNC)的铣削、打磨、或钻孔。 In a particular embodiment, the drilling, milling or grinding is completed using precision machining method, such as Computer Numerical Control (CNC) milling, grinding or drilling. 在另外的实施方式中，上述方法进一步包含在微型针阵列的微型针之间浇注粘合剂层。  In a further embodiment, the above method further comprises casting an adhesive layer between the microneedles of the microneedle array. 在其它实施方式中，上述方法进一步包含在微型针阵列上浇注挠性和粘性层。 In other embodiments, the above method further comprising casting a flexible and sticky layer on microneedle array. 在另外的实施方式中，上述方法进一步包含在负模具的微型针尖端形成微孔。  In a further embodiment, the above method further comprises forming micropores in a negative tip microneedle mold. 在上述方法的特定实施方式中，固化凝胶或浇注料是未固化的硅。  In a particular embodiment of the above method, the curable gel or castable is uncured silicone. 在其它实施方式中，固化凝胶或浇注料是聚二甲基硅氧烷(PDMS)。 In other embodiments, the curable gel or castable is polydimethylsiloxane (PDMS). 在另外的实施方式中，可溶性聚合物是水凝胶，如包含羧甲基纤维素钠的水凝胶。  In a further embodiment, the soluble polymer is a hydrogel, such as sodium carboxymethyl cellulose containing hydrogel. 在特定的实施方式中，将选定药物和/或维生素C添加到所述的负模具中，例如添加涂抹在负模具上的水凝胶。  In a particular embodiment, the selected drug and / or vitamin C is added to the negative mold, such as adding smear negative mold hydrogel. 在另外的实施方式中，本发明直接用于制作微型针阵列系统的方法包括:(a)根据上述方法的任何一种制.作微型针阵列；(b)将制作的微型针阵列安装在用于皮肤给药的盒中。 Method  In a further embodiment, the present invention is directed to manufacturing a microneedle array system comprising: (a) prepared according to any one of the methods described above for the microneedle array; (b) The produced microneedle array. mounted in the cartridge for skin administration. 在特定的实施方式中，所述的盒与注射器相连。 In a particular embodiment, the cartridge and the syringe is connected. 根据本文中的公开，本领域的技术人员容易想到本发明的这些和其它实施方式。  The disclosure herein, those skilled in the art will readily occur to these and other embodiments of the present invention. 图1A、1B和IC是正母版的放大的代表性图例。  FIGS. 1A, 1B, and IC are positive master enlarged representation of legend. 图1D是由一体的且整齐排列的单个针形成的正母版的实际图像。 Figure 1D is an actual master image being integrally formed by a single needle and neatly arranged. 图1E示出了一种利用精密打磨制造棱锥形微型针的方法。 1E shows a manufacturing method using precision grinding pyramidal microneedles. 图1F示出对利用精密打磨制作的负模具进行浇注所形成的棱锥形的微型针阵列。 FIG. 1F shows a microneedle array using the negative mold is precision polished production pyramid formed by the casting. 图1G示出由精密钻孔制作的负模具。 1G shows produced by precision drilling negative molds. 图1H示出利用精密打磨和层压方法制作的负模具。 FIG 1H illustrates a negative mold making use of precision grinding and lamination processes. 图2A和2B是由正模具和负模具制作固体穿孔器的示范性加工过程的流程图。  Figures 2A and 2B are a flowchart of an exemplary process of making a positive mold and a negative mold of a solid punch. 图2C是具有开放端的空腔的示意图。  FIG. 2C is a schematic view of a cavity having an open end of. 图2D是通过利用具有开放端的空腔阵列进行空腔填充过程的示意图。  FIG 2D is a schematic view of the cavity filling process by using an array of cavities having an open end. 图2E是粘性和挠性微型针阵列的示意图。  FIG 2E is a schematic view of the viscosity and flexibility of the microneedle array. 图3A是根据本方法使用注射器的示意图。  FIG 3A is a schematic view of use of the syringe according to the present method. 图3B和3C分别是按钮型(图3B)和鼠标型(图3C)注射器的图示。  Figures 3B and 3C are push-button type (FIG. 3B) and illustrated type mouse (FIG. 3C) of the syringe. 图3D和3E分别是与注射器相连的盒的俯视图(图3D)和截面图(图3E)。  FIGS. 3D and 3E are a plan view (FIG. 3D) is connected to the syringe cartridge and a sectional view (FIG. 3E). 图3F是插有压敏薄膜的侧视图。  Figure 3F is a side view of a pressure-sensitive film is inserted. 图4是在贴剂施用之前和/或之后的皮肤治疗的示例。  FIG. 4 is an example of a skin treatment prior to administration of the patch and / or after. 图5A和5B是SSP的实际图像。  Figures 5A and 5B are the actual image of SSP. 除非另有说明，本发明的实施例将采用工程、化学、生物化学、药理学和药物递送的本领域技术中的常规方法。  Unless otherwise noted, embodiments of the present invention will employ engineering, those skilled in chemistry, biochemistry, pharmacology and drug delivery in a conventional manner. 这些技术在参考文献中有详细解释。 These techniques are explained fully in the literature. 本发明所引用的所有的出版物、专利和专利应用，无论在前面的或在下面的，其全部内容在此引入作为参考。  All publications, patents and patent applications cited herein, both in front of or below, the entire contents of which are incorporated herein by reference. 需要注意，在本说明书和所附的权利要求中所使用的单数形式“a”、“an”和“the”包括多个对象，除非另有明确限定的内容。  It is noted that the singular form in this specification and the appended claims used in "a", "an" and "the" include plural referents unless the content clearly defined. 因此，例如，提到“蛋白质(a protein)”包括两个或两个以上的多肽混合物，等等。 Thus, for example, reference to "a protein (a protein)" includes two or more polypeptide mixture, and the like. 图1A-1C显示的是制作模具11的正微型针阵列母版的截面图，模具11包括具有上表面和下表面的孔限定平板12，可选的支撑平板13，尖针14，用于确定微型针的长度的隔板15 和针尖对准板16 (needle tip alignment plate)。  Figures 1A-1C shows a sectional view of the positive master microneedle array produced in the mold 11, the mold 11 includes an upper surface and a lower surface defining a bore having a flat plate 12, an optional support plate 13, a sharp needle 14, separator means for determining the length of the microneedle tip 15 and the alignment plate 16 (needle tip alignment plate). 可以打磨尖细金属或玻璃丝以制作尖针14。  can be polished metal or glass wool to make a tapered pointed needle 14. 所述的细丝可以是任意材料，包括金属、塑料和/或包括玻璃的陶瓷，其锐度由针的制作方式决定。 The filaments may be of any material, including metal, plastic and / or ceramics including glass, which is determined by the sharpness of the needle production methods. 对于金属针，通常打磨丝到所要求的锐度。 For the metal needle, typically polished to a desired sharpness wire. 对于玻璃或塑料材质，通常通过在玻璃化转变温度以上的温度拉伸丝可以获得尖针。 For glass or plastic material, typically by a sharp needle may be obtained at a temperature above the glass transition temperature of the drawn yarn. 在一个实施例中，针灸医用针可以用于制作正母版。 In one embodiment, it can be used to make medical needle acupuncture positive master. 所述针可以具有任何不同形状，如圆形截面，正方形截面，等等。 The needle may have any of various shapes, such as circular cross section, square cross-section, and the like. 平板12和平板13的孔可以通过钻孔、蚀刻或冲压形成。  12-well plate and the plate 13 may be formed by drilling, punching, or etching. 所述孔可以具有任意不同形状，它们可由如MEMS加工中使用的光刻和之后的蚀刻来制作。 The apertures may have any of various shapes, after photolithography and etching as they may be used to produce MEMS processing. 孔可以以任意的布置方式布置，如方形、蜂窝状，或任意图案。 Holes may be arranged in any arrangement, such as square, honeycomb, or any pattern. 下面是一个制作母版模具的实施例。 Embodiment  The following is a production master mold embodiment. 将微型针14与平板12和平板13集成的过程，包括⑴将具有相同的孔的布置方式的两个平板12和平板13平行对准，和(2)将针穿过第一平板和第二平板的孔至第二平板12以外的要求的突出长度。 Two panels 12,  14 integrated with the panels 12, 13 during the microneedles, comprising ⑴ having the same arrangement of apertures 13 is aligned parallel, and (2) the needle through the first plate hole 12 and beyond the requirements of the second plate to the second plate protruding length. 在限定平板12以外的突出长度由限定平板12和针尖对准板16之间的隔板15决定，针尖对准板16被放置在与限定平板距离突出长度且与限定平板平行的位置。  The decision between the separator 15 and the needle plate 12 is defined by the alignment plate 16 protrudes beyond the length of the defining plate 12, the needle tip alignment plate 16 is placed at a distance from the defining plate defines the position and length of the projecting parallel plates . 所述的突出长度不同，一部分取决于微型针的要求长度，可以是从0.1〜5000 μ m范围内的任何范围，如0.5〜250 μ m，或250〜1500 μ m,或这些范围内的任意长度。 The different length of the protruding portion of the length depending on the requirements of microneedles, may be within any range from 0.1~5000 μ m range, such as 0.5~250 μ m, or 250~1500 μ m, or within any of these ranges length. 通过改变隔板15的厚度可以调整限定平板12之上的微型针的长度，该长度也取决于所生产的微型针的要求长度，可以是从I〜5000 μ m范围内的任何范围，如I〜250 μ m，250〜1500 μ m，或这些范围内的任意长度。 Can be adjusted by varying the thickness of spacer 15 defines the length of the microneedle above the flat plate 12, which also depends on the length of the required length of the produced microneedles, may be within any range from I~5000 μ m range, such as I ~250 μ m, 250~1500 μ m, or any length within these ranges. 与用MEMS或其它CNC精细机械加工技术制作的正单元母版微型针不同，微型针的长度可通过调整隔板的厚度而简单地进行调整，在同一SSP中不同长度的微型针可以通过调整单个针来设计。 And using MEMS or other fine CNC machining technology to produce positive master microneedle different units, the length of the microneedles can be easily adjusted by adjusting the thickness of the separator in the same SSP in different lengths by adjusting a single microneedle needle design. 这种组合不同长度的微型针的设计可以有利地减少刺入皮肤时的摩擦。 This combination of different lengths of microneedles design may advantageously reduce friction during penetration of the skin. 支撑平板13可以是支撑针的任何构造，如海绵材料。 Support plate 13 may be configured to support any needle, such as a sponge material. 针可以用胶水或其它的固定剂或胶粘剂固定于平板13和/或平板12。 Needle can use glue or an adhesive or other fixing agent is fixed to the plate 13 and / or plate 12. 取决于平板的尺寸和存在的针的数目，针之间的距离会有所不同。 The number of plates depends on the size of the needle and the presence of , the distance between the needle will vary. 典型地，针可以以相互之间距离5 μ m〜5000 μ m被放置，如间隔100〜3000 μ m,间隔250〜1000 μ m，或这些范围内的任意距离。 Typically, the mutual distance between the needles may be 5 μ m~5000 μ m was placed, as the interval 100~3000 μ m, spacing 250~1000 μ m, or from within any of these ranges. 所述的平板可以包括任意数目的微型针，如I〜1，000，000，典型地10〜100，000，如50〜10，000，100〜1000，或这些范围内的任意数目。 The tablet may include any number of microneedles, such as I~1,000,000, 10~100,000, such 50~10,000,100~1000, or any number within these ranges typically. 在一个可选实施例中，限定平板12中的孔可被削尖成与针尖的斜率相同(图1B)。  In an alternative embodiment, the plate 12 defining the hole can be sharpened to a tip of the same slope (FIG. 1B). 单独调整可以是可寻址致动器阵列18的形式，其中每个致动器移动每个单独的针(图1C)。 May be adjusted individually addressable actuator array 18 in the form of the actuator, wherein each actuator moves each individual needle (FIG. 1C). 致动器的原理和材料可以是压电、电活性聚合物、热膨胀和电化学致动。 Principles and materials of the actuator may be a piezoelectric, electro-active polymers, electrochemical, and thermal expansion actuators. 在限定平板112中具有孔的正母版和针尖114的实际图像如图1D所不。 In an actual image defining plate 112 has a hole positive master and the tip 114 of FIG. 1D are not. 负模具是由正母版模具浇注而成。  The negative mold is cast from a positive master mold. 将可固化凝胶或可浇注的高分子材料，如未固化的硅或聚二甲基硅氧烷(PDMS)，倒在正母版模具上从而制作具有和正母版模具相同表面轮廓的负模具。 The curable gel or castable polymer material, if not curable silicone or polydimethylsiloxane (PDMS), poured onto the positive master mold to produce a negative mold having the same surface contour of the positive master mold . 另外一个准备负模具的方法是在没有组件12、15和16的情况下将正的针阵列直接浸入可固化凝胶中或热塑性材料中。 Further a method of preparing a negative mold in the absence of components 12, 15 and 16 in the case where a positive direct immersion needle array curable gel or thermoplastic material. 在这种情况下，负模具的微针形状的空腔由微型针浸入可固化凝胶中的深度决定，其用隔板或细的直线运动的致动器来控制。 In this case, the negative shape of the mold cavity is dipped in the microneedles of the microneedle curable gel determined by the depth that the separator actuator or thin to control the linear movement. 另外一个制作正的微型模具的方法是精密加工，如通过计算机数字控制(CNC)的轮廓成型磨床。  Further a method of making a micro positive mold is precision machining, such as grinding machines, profiled by a computer numerical control (CNC) of. 例如，沿着至少两个不同的方向在一个材料板上切割，以提供包含具有多个从基底突出的微型针的底面的模具，从而制得正模具。 For example, in cutting a sheet of material along at least two different directions to provide a mold comprising a bottom surface of the substrate from a plurality of protruding microneedles, thereby preparing a positive mold. 参见例如美国专利N0.7，497，980，其全部内容在此引入作为参考。 See, for example, U.S. Patent No. N0.7,497,980, the entire contents of which are incorporated herein by reference. 参考图1E，金属或可成型底板221可以沿预定的方向如222或223以预定的角度224进行重复打磨来确定纵横比，而且可以移除材料板以形成多面体的微型针225的阵列。 Referring 1E, the metal plate 221 may be molded or may be a predetermined direction, such as 222 or 223 at a predetermined angle 224 is repeated to determine the aspect ratio sanding, and an array of microneedles may be removed to form a sheet of material 225 of the polyhedron. 图1F表示溶解由硅辅助模具浇注的棱锥形的微型针阵列，该硅辅助模具由CNC轮廓成型磨床加工制作的正母版模具制得。 FIG. 1F represents dissolving silicon microneedle array cast from a mold auxiliary pyramidal, the auxiliary mold made from silicone positive master mold CNC profile forming grinder manufactured and processed. 另外一个制作正母版微型针模具的方法是由负模具浇注微型针阵列。  Further a method of making a positive master microneedle mold is cast microneedle array from the negative mold. 正母版微型针浇注件可以是任何材料，只要该材料是可浇注的且具有适合浇注之后的结构完整性。 Pouring the positive master microneedle member may be any material as long as the material is pourable and is suitable structural integrity after pouring. 微型针阵列浇注件可以是不溶于水的，如乙基纤维素，或溶于水的，如羧甲基纤维素钠(SCMC)。 Microneedle array cast member may be insoluble in water, such as ethyl cellulose, or soluble in water, such as sodium carboxymethyl cellulose (SCMC). 负模具可以通过CNC精密钻孔、铣削或打磨制作。 CNC precision negative mold by drilling, milling or grinding production. 例如，在图1G中微腔阵列232是在聚四氟乙烯板231上钻孔，用于制作乙烯纤维素正母版微型针阵列。 For example, in FIG. 1G microcavity array 232 is drilled in the Teflon plate 231, for the production of ethylene cellulose positive master microneedle array. 参考图1H，利用与CNC轮廓成型磨床相似的精密加工方法，将板242的边缘按照预定形状和切割距离进行切割，将切割板241的边缘对齐和叠放以形成负模具。 Referring to FIG 1H, with CNC profile forming grinder using a similar method of precision machining, the cutting edge plate 242 in a predetermined shape and cut distance, the cutting edge plate 241 are aligned and superposed to form a negative mold. 另外一个制作负模具的方法是通过浇注如PDMS的任意的可固化材料，从上面描述的正母版模具制得。 Also a method of making a negative mold by casting PDMS as any of the curable material, from the positive master mold prepared as described above. 利用本文所描述的技术制作SSP的代表性方法的流程图如图2A和2B所示。  technique making use of SSP representative method described herein in the flowchart shown in Figures 2A and 2B. 复制材料包括聚碳酸酯、聚甲基丙烯酸甲酯(PMMA)、聚氯乙烯、聚乙烯(PE)和聚二甲基硅氧烷(PDMS)，以及任何热或化学或光激活交联材料或热塑性材料。 Replication material include polycarbonate, polymethyl methacrylate (PMMA), polyvinyl chloride, polyethylene (PE) and polydimethyl siloxane (PDMS), and any heat or chemical cross-linking or photo-activated material or thermoplastic material. PDMS是优选的模具材料。 PDMS is a preferred mold material. PDMS的前体是二甲基甲硅烷和固化剂的混合物。 PDMS precursor is a mixture of dimethylsilyl and a curing agent. 一种优选的材料是医用级硅。 A preferred material is a medical grade silicone. 尽管至今还未被批准为医用级硅，商用SYLGARD 184(Dow Corning, Midland, Ml)可以在65°C完全固化。 While still not been approved as a medical grade silicone, commercial SYLGARD 184 (Dow Corning, Midland, Ml) can be fully cured at 65 ° C.
 由该正母版形成的包含PDMS的塑料模具有利于制作可溶解的SSP，这是由于其价格不贵，可以进行大规模生产且提供了消除可能在水凝胶中形成的微气泡的简单介质(easy medium)。  PDMS containing plastic is formed by having the positive master facilitates production of the SSP soluble, since it is inexpensive and mass production can be provided to eliminate possible formation of microbubbles in the hydrogel simple media (easy medium). 离心工艺可以用于将水凝胶溶液填入PDMS模具中。 Centrifugal process may be used to fill in the hydrogel solution in the PDMS mold. 水凝胶在没有外部压力时可以很容易填入模具的顶部，特别是当硅制模具在真空中时。 The hydrogel in the absence of external pressure can be easily filled into the top of the mold, particularly when the silicon mold in vacuo. 没有任何特定的理论限定，这可能是由于PDMS独特的表面性能以及其与水凝胶的兼容性。 Without defining any particular theory, this may be due to the unique surface properties of PDMS and their compatibility with the hydrogel. 另外一个可能的解释是，在低气压下PDMS内部产生真空，特别是在微型针的空腔壁的区域内的内部真空，是将溶液或凝胶填入微型针腔尖端的拉力。 Another possible explanation is generated at a low pressure inside PDMS vacuum, the vacuum in particular in the region of the cavity wall of microneedles is the solution or gel filled lumen microneedle tip tension. 对于大规模生产，可以利用施加到负模具底部的离心作用或真空，或将凝胶压入微型针腔的压缩力。 For large scale production, it can be applied to the negative bottom of the mold using a vacuum or centrifugation, gel or compressive force microneedle is pressed into the cavity. 如上述所解释的，在大规模生产时如果有微气泡，则设置在模具的微型针孔的底部的通风装置是有利的。 As explained above, on a large scale if the microbubbles, the ventilation means provided at the bottom of the mold micro pinholes is advantageous. 可选地，当使用负模具来制作SSP时，可以在微型针腔内部形成微孔或多孔板以使模具通风，从而防止微气泡的形成。 Alternatively, when the SSP to create a negative mold, or a porous plate may be formed in the interior of the microneedle mold cavity to vent, thereby preventing the formation of microbubbles. 一旦水凝胶干燥后，SSP从模具脱离，然后切割成贴剂元件。 Once the hydrogel dried, the SSP from a mold, and then cut into the patch element. 将包含基质材料和所选的药物或载药颗粒的液体溶液浇入诸如上面描述的PDMS的负模具中，并且进行干燥。 The PDMS mold negative  comprising a matrix material and the selected drug or drug-loaded particles is poured into a liquid solution such as described above, and dried. 根据液体溶液的粘度和其它的物理和化学性能，可以使用附加力如离心力、真空力或压缩力将液体溶液在可选的高温下填充模具。 The viscosity and other physical and chemical properties of the liquid solution, additional force may be used, such as centrifugal force, vacuum force or compressive forces liquid solution to fill the mold at high temperatures optional. 为了形成固体溶液，可以使用空气干燥、真空干燥、冷冻干燥、对流炉干燥或其它任何适合的干燥方法来干燥溶齐U。 To form a solid solution, can be dried using air drying, vacuum drying, freeze drying, convection oven drying, or any other suitable drying methods for drying solvent together U. 为了连续大规模生产，可以有效利用包括PDMS硅的挠性塑料。 For continuous mass production, effective use of flexible plastic comprises PDMS silicon. 参考图2C，为了连续生产，负模具的腔尖端是打开的206且排列起来。 Referring to Figure 2C, for continuous production, the tip of the negative mold cavity 206 is open and lined up. 由于该尖端是打开的，来自底部的真空或来自顶部的外部压力可以很容易地利用液体溶液填充该腔。 Since the tip is open, the vacuum pressure from outside or from the top of the bottom can easily fill the cavity with liquid solution. 如图2D所示，凝胶被倒出207、浇入、压制208或可选地真空处理209，然后干燥210。 2D, the gel 207 is poured, the pouring, pressing, or alternatively vacuum treatment 208 209, 210 and then dried. 一旦完全干燥后，价格不贵的塑料模具或硅制模具就可以被用作包装材料。 Once completely dry, inexpensive plastic molds, or molds made of silicon can be used as a packaging material. 直到使用时，微型针和模具可以是分开的，也可以是结合在一起的。 Until use, microneedle mold and may be separate, or may be combined together. 因为溶剂和水成分在干燥过程中会被蒸发，显得模具的尺寸并不决定SSP的最终尺寸。  because the solvent and water components are evaporated in the drying process, it is not the size of the mold determines the final dimensions of the SSP. 因此，SSP的最终尺寸比模具的尺寸小。 Thus, SSP final size smaller than the size of the mold. 可选地，微型针中多个不同的层可以通过重复浇注/擦拭相同或不同浓度的固体溶液来制得。 Alternatively, a plurality of microneedles in the different layers by repeating the casting / wiping or different concentrations of the same solution to obtain a solid. 当微型针形成之后浇注粘合剂层时，可以容易地产生粘性微型针贴剂。 When the pressure-sensitive adhesive layer is poured after the microneedles are formed, it can be easily generated sticky microneedle patch. 例如，参考图2E，浇注诸如SCMC的材料，并干燥205，接着浇注粘合剂层206，和由硅或其它软性水凝胶制成的软烘烤层207。 For example, with reference to FIG. 2E, a material such as a cast of SCMC, 205 and dried, followed by pouring an adhesive layer 206, and a soft bake layer 207 made of silicon or other soft hydrogel. 利用多次浇注工艺，制成粘性和挠性的微型针贴剂。 Using a casting process many times, tack and flexibility made microneedle patch. 干燥后的SSP从模具脱离，切割成用于贴剂元件的合适的形状和尺寸。 SSP dried disengaged from the mold, cut into a suitable shape and size of the patch element. 有代表性的这·种穿孔器的形状和尺寸的描述，见如美国专利N0.6，945，952，N0.7，182，747和N0.7，211，062，其全部内容在此引入作为参考。 Representative of the shape and size of this kind of punch-description, see U.S. Patent No. N0.6,945,952, N0.7,182,747 and N0.7,211,062, incorporated herein in its entirety Reference. 用于SSP穿孔器的合适的基质材料包括可溶解的聚合物，包括但不限于以下物质:羧甲基纤维素钠(SCMC)、透明质酸钠(HA)、聚乙烯基吡咯烷酮(PVP)、聚乙二醇(PEG)、聚乙烯醇(PVA)、聚环氧乙烧(PEO)、聚丙烯酸、聚磺苯乙烯(polystyrene sulfonate)、多肽、纤维素、羟丙基纤维素(HPC)、羟乙基纤维素(HEC)、羟丙基甲基纤维素(HPMC)、糊精、右旋糖苷、单糖和多糖、多元醇、明胶、阿拉伯胶、藻酸盐、壳聚糖环糊精、碳水化合物(carbohydrate)和其它水溶性天然和合成聚合物以及上述物质的组合。  Suitable matrix materials for the SSP perforator comprises a soluble polymer, including but not limited to, the following: sodium carboxymethyl cellulose (SCMC), sodium hyaluronate (HA), polyvinyl pyrrolidone ( PVP), polyethylene glycol (PEG), polyvinyl alcohol (PVA), polyethylene oxide burn (PEO), a polyacrylic acid, polystyrene sulfonate (polystyrene sulfonate), polypeptides, cellulose, hydroxypropyl cellulose ( HPC), hydroxyethylcellulose (HEC), hydroxypropylmethylcellulose (HPMC), dextrin, dextran, monosaccharides and polysaccharides, polyhydric alcohols, gelatin, gum arabic, alginate, chitosan cyclodextrin, a carbohydrate (carbohydrate) and other water-soluble natural and synthetic polymers, and combinations thereof. 碳水化合物衍生物，如糖类衍生物(例如，海藻糖、葡萄糖、麦芽糖、乳糖、蔗糖、麦芽酮糖、异麦芽酮糖、乳果糖、果糖、松二糖、密里糖、甘露糖、松三糖、右旋糖苷、麦芽糖糊精、艾考糊精、环糊精、麦芽糖醇(maltotol)、山梨糖醇、木糖醇、肌醇、糖醇(palatinit)、甘露醇、水苏糖和蜜三糖)，可以使用或与上述物质混合。  The carbohydrate derivative, such as sugar derivatives (e.g., trehalose, glucose, maltose, lactose, sucrose, maltulose, isomaltulose, lactulose, fructose, turanose, Miriam, mannose, sugar, melezitose, dextran, maltodextrin, icodextrin, cyclodextrin, maltitol (maltotol), sorbitol, xylitol, inositol, sugar alcohols (palatinit), mannitol, water raffinose and lyxose) can be used or mixed with the substance. 根据每个元件的物理和化学性能，通过上述物质的组合来设计机械性能和溶解速率。 The physical and chemical properties of each element, be designed by a combination of the foregoing mechanical properties and dissolution rate. 碳水化合物可以从模具上被熔化形成微型针，或用上述的水溶性聚合物溶解。 Carbohydrate may be melted to form the microneedle from the mold, or by dissolving the above-described water-soluble polymer. 一旦被干燥并且与模具分离，可以使用额外的干燥过程(后干燥处理)除去水分。 Once separated from the mold and dried, an additional drying process may be used (after drying) to remove water. 以这种方式，微型针的机械强度可以获得提高或调整，同时可以控制微型针的压缩强度。 In this manner, the mechanical strength of the microneedles may be obtained improved or adjusted, while controlling the compressive strength of the microneedles. 水溶性组分,如磷酸盐、硝酸盐和羧酸盐玻璃(carboxylate glasses),氯化镁、氯化钾和氯化钙，也可以单独或与基质聚合物混合用作基质材料。  The water-soluble components, such as phosphates, nitrates and carboxylates glass (carboxylate glasses), magnesium chloride, potassium chloride and calcium chloride, also may be used alone or mixed with the matrix polymer used as matrix materials. 该成分可以用于稳定或提高药物递送或接种能力。 The ingredients may be used to stabilize or increase the ability of the drug delivery or vaccination. 对于接种，不可溶性的颗粒，如储存佐剂(depot adjuvants),可以混合到基质中。 For inoculation, insoluble particles, such as storage adjuvant (depot adjuvants), can be mixed into the matrix. 所述基质还可以含有维生素C或维生素C衍生物。 The matrix may further contain vitamin C or a vitamin C derivative. 维生素C可以减轻可能发生的皮肤反应。 Vitamin C can reduce skin reactions may occur. 已经发现加入维生素C可以降低基质的粘度使基质以便获得更好的模具填充。 It has been found that the addition of vitamin C may reduce the viscosity of the matrix of the matrix in order to obtain a better filling of the mold. 可选地，模具的表面性能可以通过不同技术(如硅烷化、电晕处理、等离子体处理、表面涂层、聚合物表面接枝等)进行改进，以便改善凝胶与模具的兼容性，以及使溶胶干燥后容易与模具分离。  Alternatively, the surface properties of the mold can be modified by different techniques (e.g. silylation, corona treatment, plasma treatment, surface coating, the polymer surface grafting, etc. ), to improve compatibility with the gel mold easily separated from the mold, as well as the sol after drying. 本发明人发现PDMS模塑与SCMC水凝胶有很好的兼容性而且不会形成微气泡。 The present inventors found that hydrogel SCMC PDMS molding and has good compatibility and do not form microbubbles. 利用本发明描述的方法制成的贴剂优选地用注射设备(敷抹器)施加到皮肤上。  using the method described in the present invention is preferably made of a patch applied to the skin by the injection device (applicator). 图3A表示具有弹簧驱动的敷抹器的贴剂应用。 3A shows a spring-driven application patch applicator. 有固体溶液贴剂的盒301可以用压缩弹簧300安装于敷抹器上，从而形成包含有弹簧触发器303的装载有弹簧压缩的敷抹器302。 Patch box has a solid solution can be a compression spring 301 is mounted on applicator 300, thereby forming the trigger comprises a spring loaded compression spring 303 of the applicator 302. 在这个实施方式中，使用者可以独自使用微型针贴剂而不需要帮助。 In this embodiment, the user may use microneedle patch alone without help. 盒的扁平闭合形式(occlusive flat form)在储存和运输中具有体积减小的优点。 In the form of a closed flat box (occlusive flat form) has the advantage of a reduced volume in storage and transport. 在扁平形式的盒中,敷抹器的活塞击打置于皮肤上的贴剂，这可能使击打力或撞击能量最大，从而有助于SSP坚实地穿透到目标皮肤中。 In the form of a flat box, the striking piston of the applicator patch placed on the skin, which may make a maximum impact force or impact energy, thereby contributing to the target SSP solid penetrates the skin. 所述盒可以从物理和化学两个方面保护SSP不与环境接触，直到使用的时候。 The cartridge may be protected from contact with the environment SSP from physical and chemical aspects, the time until use. 容易裂开或撕裂的薄膜或膜可以保护盒中的SSP。 It tends to tear or tear film or membrane to protect the cassette SSP. 在使用扁平盒的实施方式中，微型针与皮肤接触或置于与皮肤很接近的地方，然后敷抹器的活塞部分将微型针阵列撞击入皮肤中。 In an embodiment using a flat cassette, microneedle or skin contact with the skin is placed very close to the place, and the applicator piston part will impact microneedle array into the skin. 该微型针插入的原理等同于或好于当微型针置于皮肤上而微型针与目标皮肤之间有较大空隙的情形。 The microneedle is inserted principle equivalent to or better to the case when placed on the skin with a microneedle larger clearance between the skin and the target microneedles. 图3B和3C分别显示按钮型敷抹器310(图3B)和鼠标型敷抹器313 (图3C)的另外的例子。  Figures 3B and 3C show the button-type applicator 310 (FIG. 3B) another example 313 (FIG. 3C) and a mouse-type applicator. 可以将微型针盒312连接到敷抹器310上，当按压敷抹器310时，启动触发器311。 Microneedle cartridge 312 can be connected to the applicator 310 when the applicator 310 is pressed, the flip-flop 311 to start. 在鼠标型敷抹器313中，触发器314在鼠标的顶部上。 In mouse-type applicator 313, the trigger 314 on top of the mouse. 所述盒的俯视图和侧视图分别在图3D和图3E中描述。 A plan view and a side view of the box described in FIGS. 3D and FIG. 3E. 微型针318固定在一次性塑料盒320内部的可破裂膜319上，并且微型针318被表面321上的闭合膜322保护。 Microneedle 318 is fixed inside the plastic disposable cassette 320 rupturable membrane 319 and the microneedles 318 are closed film on the surface protective 321,322. 图3F示出使用压力检测膜323的插入模式。 FIG. 3F shows a pressure sensing film 323 using the insert mode. 图4示出另一个具有包含乳霜和/或乳液的调配凝胶的贴剂应用的例子。  FIG 4 illustrates an example of another application patch formulations having gel comprises cream and / or emulsions of. 根据应用，所述的调配凝胶可以包含一种或多种与SSP中的活性成分相同或不同的活性成分。 Depending on the application, the gel formulation may comprise one or more active ingredient with the SSP same or different active ingredients. 该调配凝胶可以包含对皮肤有益的药剂，如加湿辅料或抗刺激或抗菌药剂。 The gel formulation may comprise skin benefit agents, or adjuvants such as humidifying agents or antibacterial anti-irritant. 在本实例40中，在应用贴剂之前，将调配凝胶42施加于目标皮肤43上。 40 In the present example, before application of the patch, the gel formulation 42 is applied to the target skin 43. 44中描述了贴剂应用到预处理过的皮肤上。 44 describes a patch applied to the pretreated skin. 在45和46中，贴剂施加于皮肤上，当SSP溶解后，调配凝胶施加于位置43。 In 45 and 46, the patch applied to the skin, when the SSP is dissolved, the gel formulation is applied to the position 43. 在此情形中，可以通过贴剂插入和溶解产生的孔递送凝胶中的活性成分。 In this case, the active ingredient may be delivered through the pores in the gel patch insertion and dissolution generated. SSP穿孔器可以具有直的或锥形的轴或可以是圆锥形、棱锥形、楔形或片形的，由正母版预先确定。  SSP perforator can have a straight or tapered shaft, or may be conical, pyramid, wedge-shaped, or sheet, pre-determined by the positive master. 在优选的实施方式中，SSP穿孔器的外径在其底部或第二末端是最大的，约I〜2000 μ m，第一末端附近的穿孔器的外径优选地为I〜100 μ m。 In a preferred embodiment, the outer diameter of the SSP perforator at the bottom end or second largest, about I~2000 μ m, an outer diameter near the first end of the perforator is preferably I~100 μ m. SSP穿孔器的长度典型地在10〜5000 μ m范围内，更加优选地在100〜2000 μ m范围内。 The length of the SSP perforator is typically in the range of 10~5000 μ m, more preferably in the range of 100~2000 μ m. 皮肤不是光滑的表面，而是凹凸不平微观上具有不同的深度。 Skin is not a smooth surface but microscopically uneven have different depths. 此外，角质层的厚度和皮肤的弹性随着人和人的不同而变化，随着在某一指定的人身上的位置的不同而变化。 Further, the thickness of the stratum corneum and elasticity of the skin vary from person to person varies, with different positions in a human body varies specified. 为了有效的给药和相对无痛无血的穿透，理想的穿透深度具有一个范围，而不是单一的值。 For effective and relatively painless administration bloodless penetration, a desired penetration depth has a range, rather than a single value. SSP穿孔器的穿透深度可以影响疼痛同时可以影响递送效率。 Penetration depth SSP perforator can affect pain also can affect the delivery efficiency. 在某些实施例中，穿孔器的穿透深度在10〜ΙΟΟΟμπι的范围内。 In certain embodiments, punch penetration depth in the range of 10~ΙΟΟΟμπι. 在经皮应用时，SSP穿孔器的“穿透深度”优选地小于500μπι，以便通过角质层插入皮肤的穿孔器不会穿透过表皮层。 When transdermal application, SSP perforator "penetration depth" is preferably less than 500μπι, so as not to penetrate through the epidermis of the skin punch is inserted through the stratum corneum. 这是一种可以避免接触神经和血管的最佳方法。 This is the best method that can avoid contact with nerves and blood vessels. 由于皮肤的弹性和表面的粗糙性，与SSP系统相关的基底层不会完全插入皮肤，因此，在这个应用中，SSP穿孔器的实际长度可以更长。 Since the surface roughness and skin elasticity, associated with the SSP system is not fully inserted into the base layer of the skin, so, in this application, the actual length of the SSP perforator can be longer. 根据医用的需要，在一些应用中可能需要穿透到真皮层的穿孔器。  According to the medical needs, in some applications it may need to penetrate the dermis punch. 在这些情况下，在处理即时给药的情况时利用SSP系统是现实的选择。 In such case, the SSP system to handle a situation immediate administration are realistic option. 通过调节穿孔器的变量(SSP长度，尺寸，基底或基板层的机械性能以及SSP穿孔器插入的速度和击打力)以及考虑到目标皮肤的弹性、皮肤的硬度和表面粗糙性，可以优化SSP穿孔器的穿透部分。 By variable (SSP length, dimension, mechanical properties of the substrate, or the substrate layer, and SSP perforator striking force and speed of insertion), and taking into account the roughness of elasticity, skin hardness and surface conditioning target skin perforator can be optimized SSP perforator penetration portion. SSP穿孔器的主要功能是刺入角质层以从基质进行即时给药，以及可选地，帮助使用于之后敷抹凝胶或乳霜或乳液的通道或来自存储器的通道保持打开。 The main function of the SSP perforator pierce the stratum corneum for immediate administration, and optionally from the matrix, helping the applicator after use in a gel or cream or lotion channel or channels from the memory is kept open. 只要SSP穿孔器具有合理的溶解速度，而且足够坚固可以刺入角质层，任何生物兼容材料都可以用作SSP穿孔器。 As long as a reasonable SSP perforator dissolution rate, and is strong enough pierce the stratum corneum, any biocompatible material may be used as SSP perforator. 在某些应用中，不可溶的微型针非常有用。 In some applications, insoluble microneedles useful. 此时，在上面描述的制作方法中可以使用不溶于水的水凝胶，如乙基纤维素。 At this time, in the manufacturing method described above can be used in water-insoluble hydrogel, such as ethyl cellulose. 在某些情况下，需要SSP的尖头部分具有浓缩的药物。  In some cases, the tip portion having SSP concentrated drug. 这种SSP可以通过之前描述的多次浇注/擦拭的方法和/或颗粒浓缩的方法来设计。 Multiple casting / wiping this SSP by methods previously described and / or particles concentrated approach to the design. 图5Α和5Β显示由甲基纤维素钠构成的利用硅制负模具制成的SSP的实际图像。 FIG 5Α SSP and 5Β actual image display using a negative mold is made of silicon made of sodium carboxymethyl cellulose. 在另外一个实施例中，利用上述方法可以很容易制作具有微型针阵列的挠性和粘性基底。 In a further embodiment, the flexible and can be readily made sticky microneedle array having a substrate using the method described above. 例如，SCMC填充微型针模具，顺序地浇注粘合剂层和软性水凝胶配方。 For example, SCMC microneedle mold filling, the adhesive layer are sequentially cast and a soft hydrogel formulations. 所得到的贴剂具有硬的微型针和粘性/软性底部微型针阵列，该贴剂不需要其它的粘合衬膜或覆盖物。 The resulting microneedle patch having a hard and sticky / soft bottom microneedle array, the patch does not require additional fusible film or covering. SSP贴剂系统可选地包括储存器和一个或多个穿孔器，该储存器包含有液体或用辅助药物构成的凝胶，穿孔器从该储存器表面的至少一部分延伸。  SSP patch system comprises a reservoir and optionally one or more perforations, a reservoir which contains a liquid or gel, a pharmaceutical auxiliary punch configuration extending from at least a portion of the surface of the reservoir. 所述SSP穿孔器和贴剂系统一起穿透皮肤的角质层从而加强经皮给药和提供即时给药。 And perforations penetrating the SSP patch system with the stratum corneum and thereby enhancing transdermal administration provide immediate administration. 当药物在基底层散开时，利用衬膜可以实现从基底层持续给药。 When the drug dispersed in the base layer, using the liner film can be administered continuously from the base layer to achieve. 在贴剂系统中，SSP穿孔器和储存器可以构造为单个单元或分离的单元。 In the patch system, SSP perforators and the reservoir can be constructed as a single unit or separate units. 根据应用，将SSP贴剂系统施加于皮肤，以使得一个或多个SSP穿孔器穿透角质层进入表皮或真皮层。  Depending on the application, the SSP patch system applied to the skin, so that one or more SSP perforators penetrate the stratum corneum into the epidermis or dermis. 在另外一种方法中，可以使用SSP和凝胶，乳霜和/或乳液。 In another method may be used SSP and gel, cream and / or lotion. 例如，所述凝胶可以包括药物和/或所要求的辅药，并且所述凝胶可以被施加在或喷洒在要求的位置。 For example, the gel may comprise a drug and / or adjuvant required, and the gel may be applied or sprayed on a desired position. 之后插入SSP贴剂。 After insertion SSP patch. 或者，可以在贴剂使用之后施加凝胶。 Alternatively, the gel may be applied after the use of patches. SSP系统可以传输治疗和/或预防性的药剂，包括药物和疫苗以及其它生物活性分子，经过或进入皮肤和其它组织。  SSP system can transmit therapeutic and / or prophylactic agents, including drugs and vaccines and other biologically active molecules through or into the skin and other tissues. SSP装置允许在对组织以最小的伤害、疼痛和/或刺激下经过皮肤或其它组织障碍进行给药以及到达体液。 SSP allows the device to minimize tissue damage administered, the pain and / or irritation through the skin or other tissue barriers and reach the body fluid. 在给药时，SSP穿孔器主要由活性药物(或药物颗粒本身)构成，凝胶组合物(包括乳霜和乳液)可以根据需要的药物分布曲线来进行设计。 Upon administration, the SSP perforator main (or drug particles themselves) is constituted by an active pharmaceutical gel composition (including creams and lotions) can be designed according to the drug profile desired. 根据应用，渗透活性或抗刺激的化合物或抗菌的药剂可以具有有益的效果。 Depending on the application, an osmotically active or anti-irritant compounds or antimicrobial agents may have a beneficial effect. 在诊断应用中，SSP穿孔器可以包括或由装载的与存在的特定分析物或代谢物反应的敏感材料组成。 In diagnostic applications, SSP perforator sensitive material may comprise a load or reaction with a particular analyte or metabolite present in the composition. 为了改变或控制给药速度，可以在有覆盖层的情况下，运用外部物理增强系统，如利用离子电渗疗法、电泳、声波透入法(sonophoresis)、压电响应、加热元件、磁元件或类似响应或以上响应的结合。 In order to change or control the rate of administration, may be in the covering layer, the use of an external physical enhancement system, such as the use of iontophoresis, electrophoresis, sonic penetration method (sonophoresis), piezoelectric response, a heating element, or magnetic element similar responses or more binding response. 通过SSP系统递送的药物 递送的药物可以是蛋白质、肽、核苷酸、脱氧核糖核酸(DNA)、核糖核酸(RNA)、小干扰RNA(siRNA，small interfering RNA)、基因、多糖，和合成的有机和无机化合物。  Drug delivery system by SSP  The drug delivered can be proteins, peptides, nucleotides, deoxyribonucleic acids (the DNA), ribonucleic acid (an RNA), small interfering RNA (siRNA, small interfering RNA), gene , polysaccharides, and synthetic organic and inorganic compounds. 代表性的药剂包括但不限于:抗感染药、激素、生长调节剂、调节心脏作用或血流的药物、和控制疼痛的药物。 Representative agents include, but are not limited to: anti-infectives, hormones, growth regulators, regulating cardiac action or blood flow drugs, and drugs for pain control. 所述药物可以用于接种疫苗或局部治疗或进行区域或全身治疗。 The medicament may be for vaccination or topical treatment or for regional or systemic therapy. 许多药物均可以各种治疗速率递送，通过改变一些设计因素来控制该治疗速率，该设计因素包括=SSP的尺寸、SSP中的载药量、基质的溶解速率、SSP穿孔器的数量、SSP贴剂的尺寸、凝胶(包括乳霜和乳液)的尺寸和组成、和装置的使用频率等。  Many drugs can have a variety of therapeutic delivery rate is controlled by varying the rate of this treatment some design factors, the number of design factors include the size = SSP, the SSP drug loading, the matrix dissolution rate, SSP perforator , the SSP patch size, gel size (including creams and emulsions) composition and frequency of use, and other devices. 尽管可采用通过延长SSP贴剂的穿透长度将药物直接递送进血流中，然而，大多数的SSP药物经皮递送的应用对象是表皮层。 While employed by extending the penetration length of the SSP patch delivery of the drug directly into the bloodstream, however, most of the application object SSP transdermal drug delivery is the epidermis. 本文公开的SSP贴剂系统对于控制通过除皮肤以外的组织的运送也非常有用。  SSP patch systems disclosed herein are also useful for controlling transport through tissues other than skin. 其它用于给药的非皮肤组织包括鼻腔或阴道、口腔、眼、牙齿区域、或在腹腔镜的协助下进入组织内部、或插入其它可到达的粘膜层以促进药物运送到这些组织内部或经过这些组织。 Other non-skin or for vaginal administration include nasal, oral, ocular, dental region, or into the internal tissue in laparoscopic assistance, or insertion of other accessible mucosal layers to facilitate drug delivery to tissue or through the interiors of these these organizations. 例如，可以将SSP贴剂插入患者的眼部以有利于用缓慢移动的致动器将药递送到眼睛中，从而控制或矫正结膜、巩膜和/或角膜问题。 For example, the SSP patch can be inserted into a patient's eye in order to facilitate a slow moving actuator deliver drugs into the eye, so as to control or correct conjunctiva, sclera and / or cornea problems. 调配的药物停留在组织中，即使在取掉贴剂后仍能保持给药。 Pharmaceutical formulation stays in the tissue, the administration can maintain even after removing its patch. SSP贴剂也可以插入包括颊粘膜的口腔中，进行快速全身给药或短时间给药，例如，突破疼痛管理(breakthrough pain management)和进行口腔治疗。 SSP patch may be inserted include the buccal mucosa for rapid or short-term administration of systemic administration, e.g., breakthrough pain management (breakthrough pain management) and oral treatment. 可以经过口腔黏膜递送用作牙齿矫正应用中的肌肉松弛剂的药物，以便在口腔或牙龈内进行局部治疗。 It can be delivered through the oral mucosa as orthodontic applications muscle relaxant drugs for local treatment in the mouth or gums. 另外一个例子，可以将SSP系统在体内应用，例如，覆盖胃肠道来促进对口服药物的摄取，或覆盖血管来促进药物渗入血管壁。 As another example, the system may be SSP in vivo applications, e.g., to cover the gastrointestinal tract to facilitate uptake of orally administered drugs, or to facilitate drug penetration vessel coverage of the vessel wall. 在内部组织应用的情况下，使用生物粘合剂SSP材料可以帮助SSP在体内停留更长时间。 In the case of application within the organization, using a bioadhesive material may help SSP SSP stay longer in the body. 例如在紧急情况下，可以使用包括必需的氨基酸、月旨肪和维生素的食品贴剂。 For example, in case of an emergency, can be used include essential amino acids, vitamins and fat aims month food patch. 另外一个重要的应用是接种疫苗和用于治疗和防止过敏。  Another important application is vaccination and for treating and preventing allergies. 由于皮肤中含有抗原提呈细胞如胰岛细胞和真皮树突细胞的网络，因此皮肤是有效疫苗递送的理想部位。 Since the skin contains antigen-presenting cells such as islet cells and dermal dendritic cells in the network, so the skin is an effective vaccine delivery over the site. 用于皮肤免疫的SSP系统可以减少疫苗的剂量，使药物快速递送到皮肤树突细胞，且可产生储存作用从而更好地接种疫苗。 SSP system for cutaneous immunization may reduce the dose of the vaccine, the drug quickly into the skin dendritic cells, and can produce a depot effect to better vaccination. 可以很容易设计出用于多价疫苗的SSP系统，其预期在运送和存储时比液态疫苗具有更好的稳定性。 SSP can be very easy to design a system for a multivalent vaccine, which is expected to have better stability than the liquid vaccine during transportation and storage. 本发明的另外一个重要的应用是用于药用化妆品(cosmeceutical)。 Another important application of the  present invention is a cosmeceutical (cosmeceutical). 带有颗粒的SSP系统可以有效地和安全地用于去除或减少皱纹形成、皮肤老化多汗和脱发。 SSP system with a particle can be effectively and safely be used for removing or reducing wrinkles, skin aging and hair loss sweating. 例如，可以利用本文所述的系统递送肉毒杆菌毒素(肉毒杆菌素)、醇酸、维生素和维生素衍生物、表皮生长因子(EGF)、腺苷、熊果苷等。 For example, systems described herein may be utilized to deliver botulinum toxin (Botox), alkyd, vitamins and vitamin derivatives, epidermal growth factor (EGF), adenosine, arbutin. 所述系统还可以用于治疗病变或异常皮肤特征，如常见于脸部、手臂、腿或脚上的丘疹、痤疮、鸡眼、疣、胼胝、拇囊肿、光化性角化病和角化过度硬皮病。 The system may also be useful for treating lesions or abnormal skin features, as is common on the face, arm, leg or foot, pimples, acne, corns, warts, calluses, bunion, actinic keratosis, hyperkeratosis and scleroderma. SSP系统还可用于美容应用中的文身(tattoo)形成/去除贴剂。 SSP system can also be used in cosmetic applications tattoo (Tattoo) form / the patch is removed. 活性的或假(sham)的SSP系统也可以用于针灸。 Active or sham (Sham) may also be used in SSP systems acupuncture. 下面是实现本发明的具体实施方式的实例。  The following are examples of specific embodiments of the present invention is implemented. FIG. 提供这些实例只是为了说明的目的，而不是为了限制本发明的范围。 These examples are provided for illustrative purposes only, and are not intended to limit the scope of the present invention. 图1D中所示为通过对光致抗蚀膜上的通孔进行化学蚀刻而在玻璃中制出孔，以及针灸针对准和通过孔114，该光致抗蚀膜通过光刻形成。 To chemical etching vias through the photoresist film in the glass prepared hole shown in  1D, the registration and for acupuncture and through the aperture 114, the photoresist film is formed by photolithography . 对通过孔的针的尖端进行了描述。 For it has been described by the tip of the needle hole. 将PDMS浇在这面且固化一晚上。 PDMS was poured on this surface and cured overnight. 将8%的甲基纤维素钠的水凝胶浇在该硅制模具上，然后以3000rpm离心5分钟。 8% of sodium methyl cellulose hydrogel poured onto the silicon mold, and then centrifuged for 5 minutes at 3000rpm. 离心后，将水凝胶干燥一天，从模具上剥离。 After centrifugation, the aqueous gel is dried one day, the release from the mold. 图5是由纤维素制得的可溶性微型针的图像。 FIG 5 is an image obtained by a soluble cellulose produced microneedles. 图1F中描述了另外的用CNC轮廓成型磨床技术制作的微型模具。 FIG. 1F is described in additional micro CNC profile forming grinder mold making techniques. 用测力计(NexyGen DF系列)来进行压缩测试，测量微型针折断时所施加的圆锥形压缩力。  tested for compression dynamometer (NexyGen DF series), measure the conical microneedle broken when the applied compressive force. 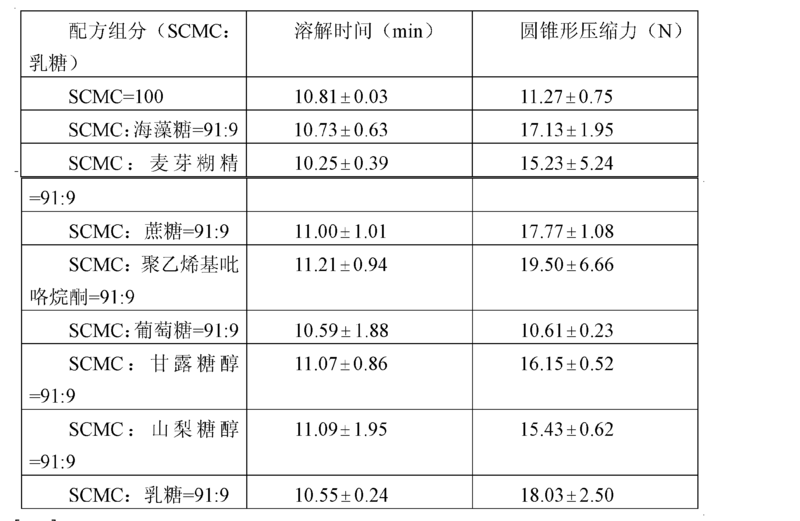 利用不同的糖类衍生物和羧甲基纤维素钠(SCMC)制作测试样品。 Test samples prepared using different saccharide derivatives and sodium carboxymethyl cellulose (SCMC). 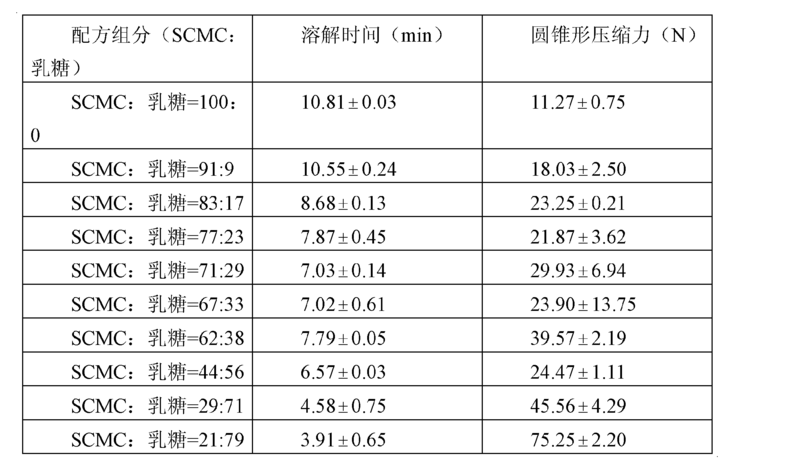 将8%的SCMC与去离子水混合。 The 8% SCMC with deionized water. 测量在300rpm时SCMC完全溶解于IOml的去离子水中的时间。 Measured at 300rpm SCMC time completely dissolved in the deionized water IOml. 由于糖类衍生物是加入到固定的8%的SCMC水凝胶中，因此结果进行了重量归一化。 Since saccharide derivative is added to a fixed 8% SCMC hydrogel, so the results were normalized by weight. 结果见表I。 The results are shown in Table I. 对不同乳糖组分进行了压缩和溶解测试。  Different components is compressed and lactose dissolution test. 当加入乳糖时，所测试的颗粒溶解速度加快，压缩力增加。 When lactose is added, the rate of dissolution of the particles accelerated test, the compressive force increases. 见表2。 Table 2. 为了治疗痤疮，在敷用痤疮凝胶后，涂覆过氧化苯甲酰微型针贴剂。  For the treatment of acne, acne after the application of the gel, the coated microneedle patch benzoyl peroxide. 经过微型针贴剂和凝胶治疗后，痤疮的严重性显著和快速降低。 After the microneedle patch and gel in the treatment of acne and the severity of the rapid decrease significantly. 如图6所示，组合治疗显得比微型针贴剂更为有效。 6, the combination treatment appears to be more effective than the microneedle patch. 进行所有的治疗后，治疗的痤疮位置变软和光滑。 After all treatments, acne treatment position becomes soft and smooth. 组合治疗是有用的。 Combination therapy is useful. 例如，SSP可以在夜间涂覆，之后的凝胶在白天敷用。 For example, the SSP may be applied at night, in the daytime after gel deposited. 按如下描述进行两步浇注。  casting in two steps as described below. 首先，将含有微颗粒的凝胶浇到模具上，之后马上将腔外面的凝胶去除而保留腔内的凝胶。 First, the gel containing the microparticles is poured into the mold, the outside of the chamber immediately after the gel is removed while retaining gel cavity. 在第二步涂敷中，将由不含微颗粒的辅药制成的凝胶加到疫苗层上。 In the second step of the coating, made by the gel adjuvant free vaccine microparticles is applied to the layer. 微颗粒的数量由它们在贴剂的第一层凝胶中的浓度和全部腔的体积来确定。 Number of microparticles is determined by the volume of all cavities and their concentration in the first layer of the gel patch. 将硅制模具放入27英寸Hg的真空中，使在硅内部形成真空。  The silicon mold was placed 27 inches Hg vacuum, vacuum formed within the silicon. 接着，将含有10%乳糖的SCMC凝胶涂覆在模具上。 Subsequently, the mold containing the gel coating SCMC 10% lactose. 在凝胶层下的锥形腔中的空气被慢慢地移入硅体内，将模具上的SCMC凝胶拉入腔中，最后填入到腔的尖端。 Air conical cavities under the gel layer is gradually moved into the silicon body, the pull-SCMC gel into a mold cavity, and finally filled into the tip cavity. 在同样的测试中使用去离子水。 Using deionized water in the same test. 实验参数和结果在下面给出。 The experimental parameters and results are given below. 因此，本文描述了利用药物和载药凝胶的SSP系统和其制作以及其使用。  Accordingly, described herein are pharmaceutical and drug using gel SSP system and its production and use. 尽管对本发明的优选的实施方式进行了较详细的描述，应当理解，在不偏离本文的权利要求所限定的发明精神和范围的情况下，可以`进行显而易见的变型。 Although preferred embodiments of the present invention has been described in detail, it should be understood that the spirit and scope of the invention without departing from the herein defined by the claims may be apparent to `modifications. 1.一种制作微型针阵列的方法，包括: (a)通过将微型针放置在包含有上表面和下表面的限定平板中制作正母版模具，其中所述微型针以彼此相距预定距离进行放置，而且所述微型针的尖端从所述限定平板的底部关出; (b)通过在所述正母版模具上浇注浇注料或将所述正母版模具浸入固化凝胶或热塑性材料中来制作负模具，从而制造具有和正母版模具相同的表面轮廓的负模具； (c)在所述负模具中添加可溶性聚合物从而形成微型针阵列；以及(d)干燥所述微型针阵列。 1. A method of manufacturing a microneedle array comprising: (a) placed by the microneedles with the production positive master mold defining a flat surface and a lower surface, wherein the microneedles at a predetermined distance apart from one another placed, and the tip of the microneedle from said bottom plate defining a clearance; (b) by casting cast onto the positive master mold or the expected positive master mold is immersed curable gel or thermoplastic material to make a negative mold, thereby producing a negative mold having the same surface contour of the positive master mold; (c) adding the soluble polymer in the negative mold to form a microneedle array; and (d) drying the microneedle array. 2.根据权利要求1所述的方法，其中，所有被放置在所述限定平板中的微型针从所述限定平板的底部突出的距离相同。 The method according to claim 1, wherein all the defining plate disposed microneedles projecting from the bottom of the same distance to the defining plate. 3.根据权利要求1所述的方法，其中，所述被放置在所述限定平板中的微型针中的至少一个从所述限定平板的底部突出与其它微型针不同的距离。 At least one microneedle projecting the other a different distance from the bottom of the defining plate 3. The method according to claim 1, wherein the plate is placed in the defined micro-needles. 4.根据权利要求1-3中任一项所述的方法，其中，使用致动器装置来调整在所述限定平板中的单个针的长度，所述致动器在所述限定平板中将单个针移至要求的距离。 4. A method according to any one of claims 1-3, wherein the actuator means used to adjust the length of the individual defined in the needle plate, the actuator will be defined in the plate a single needle to move the required distance. 5.根据权利要求1-3中任一项所述的方法，其中，利用在与所述限定平板相距要求距离处的停止壁来确定所述微型针顶端的位置。 5. The method according to any one of claims, wherein, in use of the defining plate at a distance from the stop wall required to determine the position of the tip of the microneedle. 6.根据权利要求1-3中任一项所述的方法，其中，利用所述限定平板中的锥形孔来确定所述微型针顶端的位置。 6. The method according to any one of claims, wherein, by the tapered bore defined in said plate to determine the position of the tip of the microneedle. 7.根据权利要求1-3中任.一项所述的方法，其中，所述固化凝胶或浇注料是未固化的硅。 According to any of claims 1-3. The method of any one of, wherein the curable gel or castable is uncured silicone. 8.根据权利要求1-3中任一项所述的方法，其中，所述固化凝胶或浇注料是聚二甲基硅氧烷。 8. The method according to any one of claims, wherein the curable gel or castable is polydimethylsiloxane. 9.根据权利要求1-3中任一项所述的方法，其中，所述可溶性聚合物是水凝胶。 9. The method according to any one of claims, wherein said soluble polymer is a hydrogel. 10.根据权利要求9所述的方法，其中，所述水凝胶包含羧甲基纤维素钠。 10. The method according to claim 9, wherein the hydrogel comprises sodium carboxymethyl cellulose. 11.根据权利要求1-3中任一项所述的方法，其中，在所述负模具中添加选定药物。 11. The method according to any one of claims, wherein the negative mold in a selected medicament is added. 12.根据权利要求1-3中任一项所述的方法，其中步骤(c)包括，在负模具上施加了可溶性聚合物后对负模具施加真空、离心或压缩力，以便利用该可溶性聚合物填充所述负模具并形成微型针阵列。 12. A method according to any of claims 1-3, wherein step (c) comprises applying a vacuum force is applied, centrifugation of the soluble polymer in the negative mold or negative mold compression, so that the use of soluble polymers filling the negative mold material and forming a microneedle array. 13.根据权利要求1-3中任一项所述的方法，进一步包括将所述干燥的微型针阵列与所述负模具分离。 13. The method according to any one of the preceding claims, further comprising the dried microneedle array from the negative mold separation. 14.一种制作微型针阵列的方法，包括: (a)通过在预定的方向以预定的角度对金属或可成型板进行钻孔、铣削或打磨来制作正母版模具，以便限定多个微型针； (b)通过在所述正母版模具上浇注浇注料，或将所述正母版模具浸入固化凝胶或热塑性材料中来制作负模具，从而制造具有和正母版模具相同的表面轮廓的负模具； (c)在所述负模具中添加可溶性聚合物，从而形成微型针阵列；以及(d)干燥所述微型针阵列。 14. A method of manufacturing a microneedle array comprising: (a) drilling, milling or grinding to produce a positive master mold or a metal plate may be formed in a predetermined direction by a predetermined angle, so as to define a plurality of micro needle; (b) by casting the castable positive master mold, or the positive master mold is immersed curable gel or thermoplastic material to make a negative mold, thereby manufacturing the same having the positive master mold surface profile negative mold; (c) adding the soluble polymer in the negative mold to form a microneedle array; and (d) drying the microneedle array. 15.根据权利要求14所述的方法，其中，所述钻孔、铣削或打磨是利用精密加工完成的。 15. The method according to claim 14, wherein the drilling, milling or grinding is done using precision machining. 16.根据权利要求15所述的方法，其中，所述钻孔、铣削或打磨是通过由计算机数字控制的钻孔、铣削或打磨完成的。 16. The method according to claim 15, wherein the drilling, milling or grinding is controlled by a computer through a digital drilling, milling or grinding completed. 17.根据权利要求14-16中任一项所述的方法，其中，所述固化凝胶或浇注料是未固化的硅。 17. The method according to any one of claims 14-16 wherein the curable gel or castable is uncured silicone. 18.根据权利要求14-16中任一项所述的方法，其中，所述固化凝胶或浇注料是聚二甲基娃氧烧。 18. The method according to any one of claims 14-16 wherein the curable gel or castable polydimethyl baby oxygen to burn. 19.根据权利要求14-16中任一项所述的方法，其中，所述可溶性聚合物是水凝胶。 19. The method according to any one of claims 14 to 16 claim, wherein said soluble polymer is a hydrogel. 20.根据权利要求19所述的方法，其中，所述水凝胶包含羧甲基纤维素钠。 20. The method according to claim 19, wherein the hydrogel comprises sodium carboxymethyl cellulose. 21.根据权利要求14-16中任一项所述的方法，其中，在所述负模具中添加选定药物。 21. The method according to any one of claims 14-16, wherein, in the negative mold add selected medicament. 22.根据权利要求1-3和14-16中任一项所述的方法，其中，所述方法进一步包括在所述微型针阵列的所述微型针之间浇注粘合剂层。 1-3 and 14-16 22. Method according to any one of claims, wherein the method further comprises casting an adhesive layer between the microneedle array of the microneedle. 23.根据权利要求1-3和14-16中任一项所述的方法，其中，所述方法进一步包括在所述微型针阵列上浇注挠性和粘性层。 1-3 and 14-16 23. Method according to any one of claims, wherein the method further comprises casting a flexible and sticky layer on the microneedle array. 24.根据权利要求1-3和14-16中任一项所述的方法，其中，所述方法进一步包括在所述的负模具中添加维生素C。 1-3 and 24. The method according to any one of claims 14 to 16 claim, wherein said method further comprises the vitamin in a negative mold C.
25.根据权利要求1-3和14-16中任一项所述的方法，其中，所述方法进一步包括在所述负模具的微型针尖端形成微孔。 1-3 and 14-16 25. Method according to any one of claims, wherein the method further comprises forming micropores in the negative mold microneedle tip. 26.一种制作微型针阵列系统的方法，包括: Ca)根据权利要求1-3和14-16中任一项所述的方法制作微型针阵列；以及(b)将所述制作的微型针阵列安装在用于皮肤给药的盒中。 26. A method of manufacturing a microneedle array system, comprising: Ca) 1-3 and 14-16 The method of any one of claims manufacturing a microneedle array; and (b) to produce the microneedle array is mounted in the cartridge for dermal administration. 27.根据权利要求26所述的方法，其中，所述盒与注射器相连。 27. A method according to claim 26, wherein said cartridge is connected to the syringe. IT1403293B1 (en) * 2010-12-27 2013-10-17 Fond Don Carlo Gnocchi Onlus Apparatus to needles for the transdermal administration of drugs. OA5448A (en) * 1975-10-16 1981-03-31 Manufrance Manufacture Francai Multipénétrant device vaccinator. MXPA03009603A (en) 2001-04-20 2004-12-06 Johnson & Johnson Microprojection array having a beneficial agent containing coating.